When Koji Igarashi left Konami in 2014, fans of his work were left stunned and concerned. I was one such fan who has been worried about the direction of the Castlevania series for some time as it seemed that the games seemed to be pulled in a different direction. I was sure Igarashi would land somewhere, but I wasn't sure where or what he would be doing. Soon, it became clear that the man who married the gothic action adventure gameplay of Castlevania with the seamless, expansive level design of Metroid was about to do something very big. It was been noted since his departure from Konami that Igarashi was seemingly trapped in a cycle of working on projects that he was nowhere near interested in being a part of. Igarashi wanted to work on more "Metroidvania" titles, but higher ups at his former employer determined that nobody wanted those types of gameplay elements anymore. With that, it was no surprise that Igarashi began work on a "spiritual successor" to his heralded Castlevania titles. This game is titled Bloodstained: Ritual of the Night and a Kickstarter campaign was started to fund the initial development of the title. It's safe to say, if there was any question involving the viability of a game of this type in the current age of gaming it was quelled with the Kickstarter campaign for Bloodstained raising almost $2.7 million more than it's initial goal of $500,000. Does this prove that nostalgia is just as strong among gamers as it's ever been, that we still want games that harken to the days where we clamored for the latest big thing from Japanese developers, or that a title featuring a female protagonist can truly garner this level of grassroots interest from the gaming public? Maybe all three. The last time I saw a title that was still technically vaporware starring a female character garner this much buzz without seeing any actual gameplay was when a teaser for a possible Beyond Good and Evil sequel popped up on an Ubisoft sizzle reel during E3 a few years ago. Knowing that such a big positive response came from a title like this may not trigger a ripple effect among major publishers who don't seem to get that the ballooning budgets they command for their upcoming titles aren't necessarily vital to big sales numbers. That's quite a sobering thought. If the last few years have shown us anything it might be that gamers don't always need ridiculously realistic games filled to the brim with tropes that got old when the Atari 800 was cutting edge. Legends in gaming are stepping out of their corporate safe spaces to take chances in the indy realm. Tim Schafer, Keiji Inafune, and now Koji Igarashi are a part of an ever growing list of big names in game development who are essentially doing a new version of what the founders of Activision did in the early 80s. They're making games that they and (as evident by the response to their fund raising efforts illustrate) gamers in general want to play. These games don't get big name voice actors, huge advertisement budgets, and the other trappings that the average "AAA" title enjoy, but they have something those games tend to severely lack. That thing is a soul, and because of that I'm waiting with great anticipation for Bloodstained. First off, the big disclaimer: the in-game story is pretty non-existent. You get about all the depth of a 10-minute filler episode from Steven Universe stretched over several hours of gameplay. So if you’re coming to this looking for lore and character development, you’re not going to get it. If you’re here to see Garnet rocket-punch monsters – and that’s enough for you – you’ll have a great time. You have turn-based play, with a timing-based setup for attacks and defenses - tap the screen at the right time, you do extra damage or you block most of the damage, respectively. This is a game mechanic that was first brought to us on the Super Mario RPG back in the days of Super Nintendo and has seen occasional use in other games. It remains a great, if under-utilized, setup for a lot of RPGs – and keeps it fun and engaging. 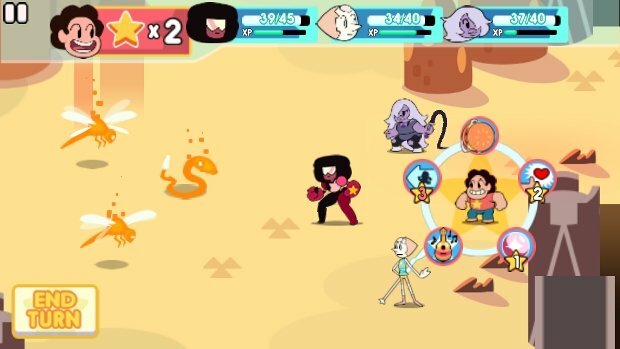 Unlike the usual JRPG setup where each character gets 1 action, the game instead gives your team a number of Stars every turn, which you spend to use actions from any of the Gems or Steven himself. This actually sets up some interesting choices: do you do a single big attack, do you do several small ones? Which attacks are best suited to the types of enemies you are fighting? Should you break the armor of the tough guys first, or clear out the small support monsters? You can also save some unspent Stars for the next round, allowing you to pull off bigger attacks or waves of heavy hits. The other fun tactical element is that a Gem has to have a certain amount of health (“Harmony”) to use their big attacks. If they’re too hurt or weak, your special moves will be locked out. This forces you to pay attention to defense as well as offense; you want to be well healed up between and during fights. 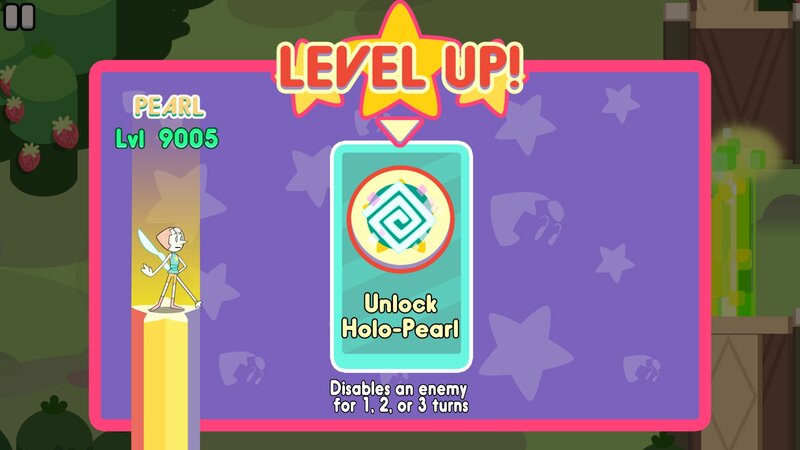 There’s a few bits of character building: each level you can pick from 3 different options to upgrade the Gem in question – a better special attack, improve stats, and so on. Each Gem also can equip “badges” – the usual JRPG accessory that gives you stat boosts or special modifiers on your attacks or defenses. The maps are simple but clean. There are a few hidden objects that just require you pay attention, and a few combination puzzles which only require that you write down the solution on the map when you run across it. The production quality is pretty great. The simplified character designs fit very well with the Steven Universe art from the show, and the voices and music are high quality as well. Most of the dialogue is text box, but the characters have many phrases from the show used to highlight certain things like finding secret rooms, or leveling up. The animation is fun and the controls are pretty great for touchscreen gaming. All in all, I give this a 3.5 out of 5. The game is a fun game, and easily worth the cost, but it lacks the usual lore building and character development bits you’d usually get in a Steven Universe TV episode - which is the part that hurts it. As I played through, I realized you could have slapped any other characters from any other comic, cartoon, or TV series and you’d pretty much only change the labels to a lot of the mechanics in play. Other than their well known roster of characters, Nintendo's gaming experiences have been equally hallmarked by the great controllers they employ. This was especially evident by the number of control options available for the NES. In addition to the standard control pad, Nintendo also sold two more official controllers in the arcade styled NES Advantage and a smaller controller called the NES Max. The NES Advantage, with it's arcade styling, became instantly more popular. The NES Max has however become the go to aftermarket controller for a lot of retro gamers who want a little more bang for their button press. I finally got my hands on one and while it works great with some games, it isn't a perfect fit for others. 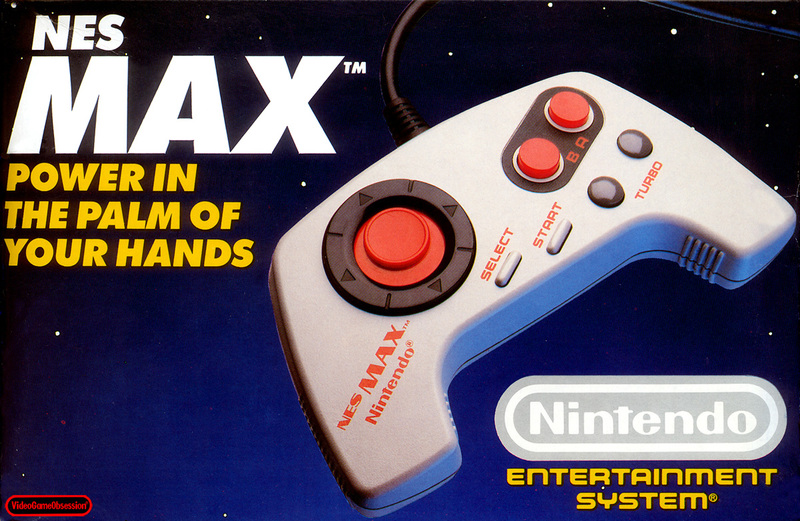 The first thing a gamer will notice about the NES Max is the lack of an actual control pad. Instead there is a little red disc that the player slides in different directions to move their character. Ideally, the disc will function much like the standard cross directional controls on a stock NES controller. This didn't seem to be the case with the NES Max that I was given to review, and the controller didn't feel as responsive in side scrolling action games as one would like. It does, however work quite well with vertically scrolling action games, racing games, and to a lesser extent, sports games. The NES Max's turbo buttons are functional and work just as you'd expect. The rate of fire can't be adjusted like the NES Advantage, and it also lacks the rapidly pausing "slo mo" feature. While this feature was quite popular with gamers when it was new and shiny, in hindsight it was a bit annoying and the lack of "slo mo" in the NES Max isn't a big deal. All in all, the NES Max is a solid controller that, while not perfect, is a solid choice for the gamer looking for a secondary option for his NES controller needs. There were other controller options for the console, but Nintendo provided two quality choices in the NES Advantage and NES Max. It may not work perfectly for Contra or Mega Man, but for games like 1943, Commando, or Kung Fu Heroes it's a great fit. *Shout out to the good folks at The Classic Gamer for providing the controller for this review.